Writer of "International Picture Language"
"Our unlooked-for development of the hundred years between 2000 and 2100 was the way in which Basic English became in that short time the common language for use between nations. . . . By 2020 almost everyone was able to make use of Basic for talking and writing." -- H. G. Wells. Put into Basic from The Shape of Things to Come.. 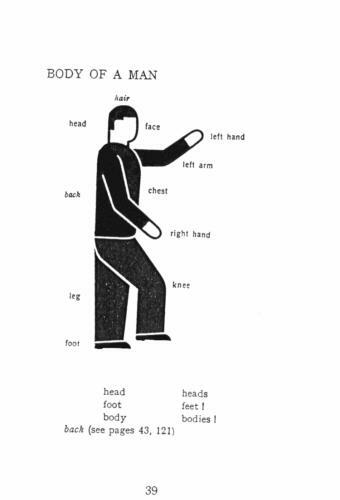 Basic English for which Dr. Neurath has made this book of international pictures, is a simple but natural form of English designed for international use. English is the most talked language of the earth. by cutting its 250,000 words down to 850 and doing without its complex 'verb'-system, Basic may well become a second language for all. 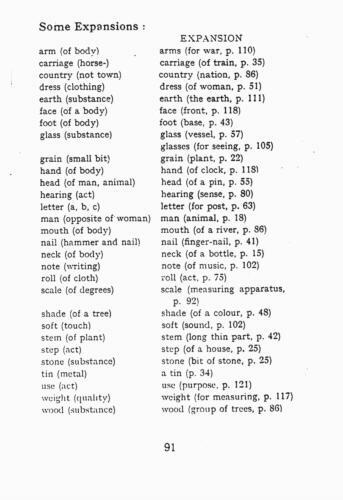 the list of books on the last page gives some idea of its range. As with any language, there are more ways than one o teaching Basic, though all will necessarily be based on the development outlined in The ABC of Basic English. A line of attack which is good for one learner may not be good for another, and if a knowledge of Basic is to be given in the shortest possible time it is important to give attention to the needs of different sorts of learners. For this reason a wide selection of teaching material will be produced. Basic Step by Step gives an example of teaching by reading, and other step-by-step systems are on the way. The Basic teaching apparatus will not be complete, however, till the help which pictures may give has been fully taken into account. Dr. Neurath is one of the great experts in the science of teaching by pictures, and his Isotype signs, in addition to their international design and their power to make themselves clear, have a simple quality which makes them pleasing to the eye. The work he has done for Basic is of very great value. 10, King's Parade, Cambridge, England. 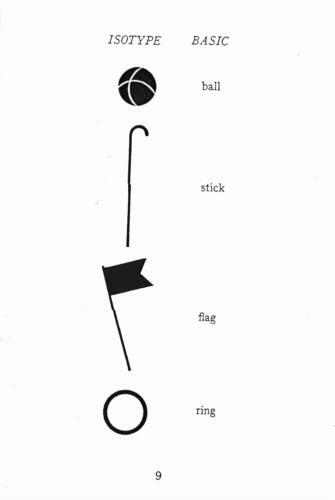 Basic by Isotype is an example of the way in which pictures may be of help in making the sense of words and statements clear. This book is not able to give more than a rough outline. It does not give any examples of all the ways in which the 850 words may be used. For these purposes there are the two books The ABC of Basic English and The Basic Words. Basic by Isotype is for use in connection with these. Isotype is an international picture language (see International Picture Language, Number 83 of the Psyche Miniatures, General Series) which makes use of a great number of signs in such a way that the same sign is at all times representative of the same thing. The signs are clear and simple, and so designed that the most important points are seen straight away and are kept in the memory. 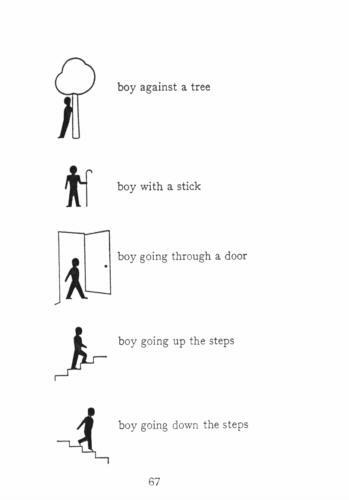 a picture-book using Isotype signs is specially important for persons who have the desire to go forward not only with the help of a teacher but by themselves. It will be noted that for picture teaching a special organization of the material is necessary. 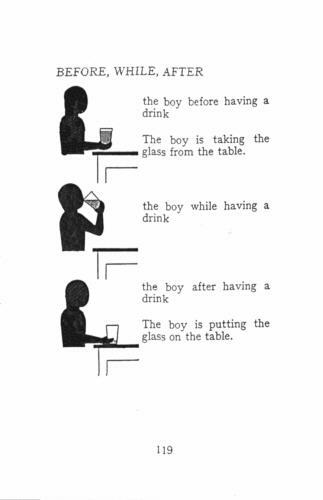 For example, the word-parallel of the pictures naturally makes use of the third person ("the boy is making a picture") more frequently than of the first and second ("I, (we, you) make pictures"). To make clear the sense of some of the quality words, more than one example is given. The quality common to the things in these examples is the quality in question. Basic by Isotype is part of the Isotype system of education through the eye, worked out by the International Foundation for the Promotion of Visual Education and its Institutes. 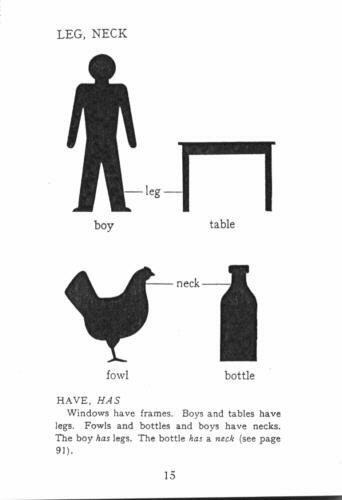 I am in debt to Miss L. W. Lockhart of the Orthological Institute and to Miss M. Reidemeister of the International Foundation for Visual Education, and to Mr. G. Arntz and Mr. E. Bernath, the Isotype-designers, all of whom have given much time and attention to the work. The interest of Mr. C. K. Ogden in the questions covered by this book has been of special value to me. OTTO NEURATH. 267 Obrechtstraat, The Hague, Holland. The rest of this book consists of the Isotype language symbols with the BASIC word. Some sentences start to be introduced on page 14 and the final pages are mostly words with a few pictures.